A dinner series called the Twelve Days of Christmas hosted by a Jewish chef wouldn’t be complete without Chinese food, right? 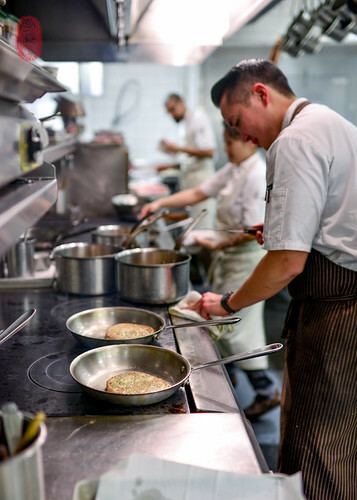 He’s the chef and co-owner of Oxheart, a restaurant in Houston where he has earned national acclaim for his vegetable-focused menu. The last time I was in Houston was in 1988. So, unfortunately, I haven’t eaten at Oxheart yet. But, by coincidence, I’ve had quite a few opportunities to taste Yu’s food this year. I walked into the kitchen and Karen Man was making scallion pancakes. 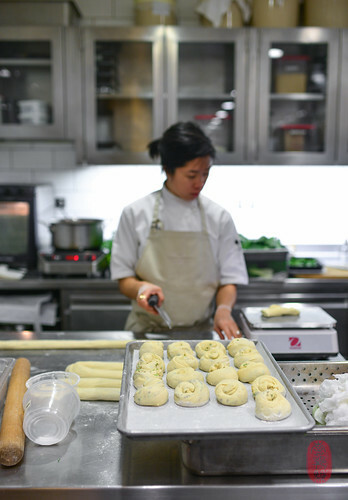 She was spreading the sticky, bubbly dough with a scallion paste made with pork fat. One by one, she rolled them up, forming them into little rounds to rest. 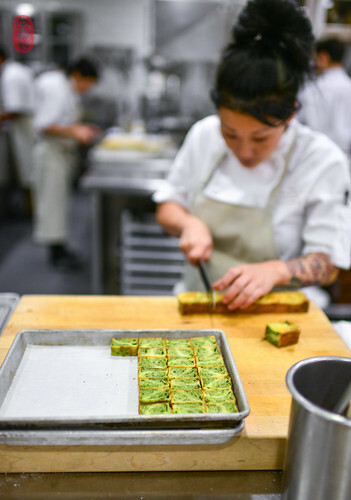 On the other side of the kitchen, Katianna Hong, the executive sous chef at The Restaurant at Meadowood, was also rolling out dough. Onto it, she was spreading a green paste made from random cuttings of winter greens from the garden. Hong rolled the sheet of dough into a log and tucked the entire strip snuggly into a buttered babka mold. She patted a strip of parchment paper on top of the dough, making sure the top was even, and then weighted it all down with rocks. Back and forth Man and Hong moved, between their floured countertops, with their rolling pins, and their babka molds and sheet trays. It was great, this synergy, between East and West, Yu and Kostow. It became a running thread that tied this dinner together nicely, placing it among my favorite dinners this years. 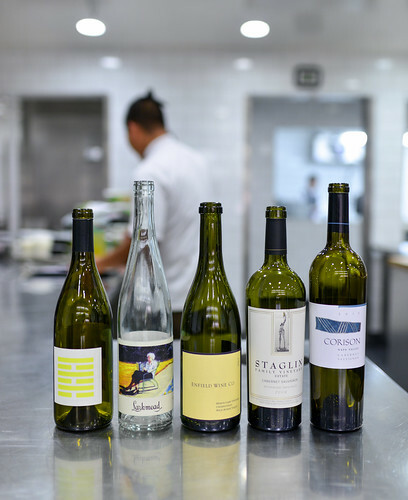 On the night before the Twelve Days of Christmas started, I had dinner at The Restaurant at Meadowood. At the end of my meal, Kostow served a miniature chocolate babka, topped with a thin plaque of chocolate that was melting onto the warm cake. 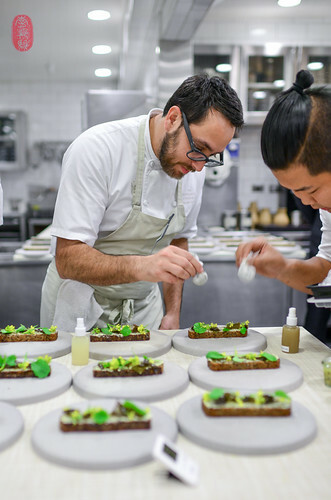 At this dinner, he turned those babkas into canapés. Now swirled with winter greens instead of chocolate, they were quickly toasted and topped with a slice of goat butter. I might have had a two or three of them (don’t worry, I made sure everyone else got one first). Along with the vegetable-filled crystal dumplings (a.k.a. har gow) in warm kohlrabi broth that Justin Yu served, and his mung bean crêpes, the three canapés presented on this night were among my favorite canapés this year. 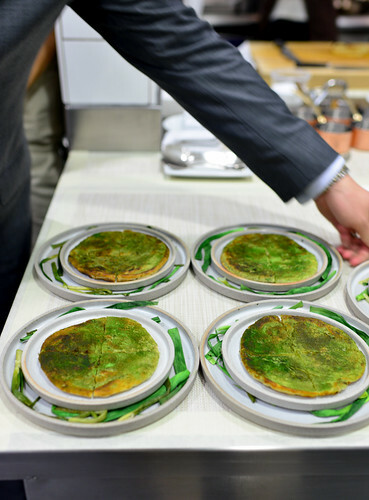 Those mung bean crêpes were folded over a Gulf shrimp filling pungent with “Gulf shrimp sofrito,” which Yu made from dried Gulf shrimp in the style of Chinese dried shrimp. 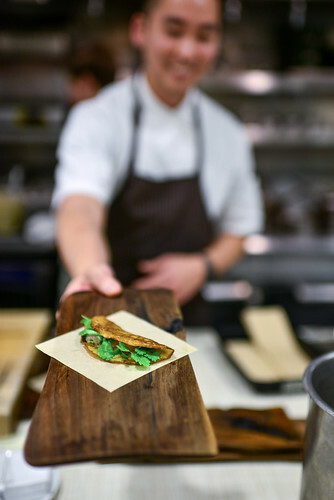 I especially loved the bit of cilantro tucked into the wrap, providing a bright, grassy relief from the rich, flavorful sofrito. It was a fantastic combination of textures and flavors. Back to those scallion pancakes: they were pan-fried, and then dusted with a powder of dried scallions and collard greens. Golden and crispy on the outside, they were hot and flavorful on the inside. Infused with pork fat and scallion, they were fatty without being soggy or greasy. The cakes were quartered and sent out to tables to share. On the side, Yu served a relish of radishes cooked down in pork fat. The highlight of this dinner for me was Yu’s smoked beef ribs. These Flintstone-sized plate ribs, which are commonly used in Texas barbecue, were rubbed with black pepper and smoked on the bone. For service, the ribs were removed and the beef sliced thick, the way Texas brisket is. 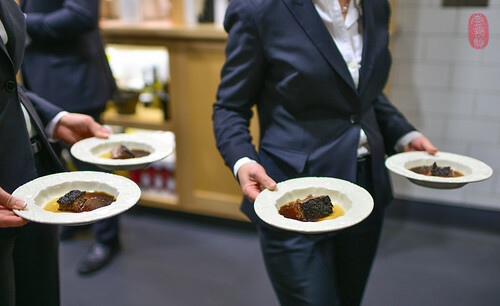 The meat was served with nothing more than a warm beef broth spiked with tangy Chinese black vinegar. The simplicity of it was a confident statement; it really needed nothing more. The meeting of ashy, black pepper heat with the sweet, musty acidity of the vinegar was a combination that was both new, and yet familiar to me. It was at once Texas barbecue, and Chinese beef; common ground between two seemingly different cultures and cuisines. Exceedingly moist and fatty, the meat was perfectly cooked, served with only a fork and spoon. 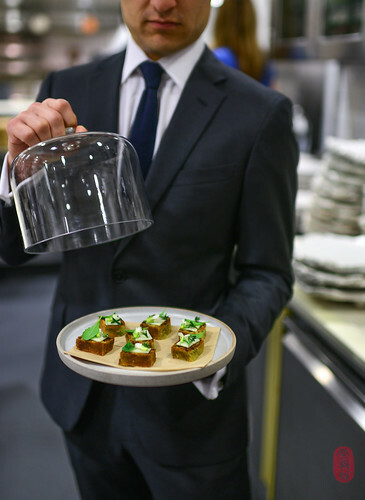 On Kostow’s side of the menu was a tartine of herbs and seaweed, served with a jar of whelk conserva. The tender whelk meat was suspended in a flavorful fat, which I spooned liberally over the buttered strip of bread. Kostow also served a rosy slice of duck breast with vegetables from the garden. And for dessert, Kostow presented a crowd favorite: a rich purée of grilled dates anointed with a touch of walnut oil. Below, you’ll find the menu from the eleventh night of the Twelve Days of Christmas featuring Justin Yu. To see all of the photos from this dinner, CLICK HERE. 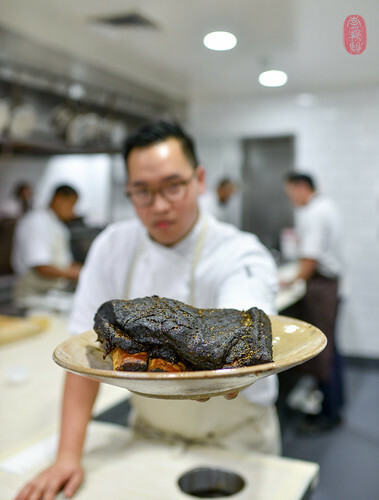 Photos: Yu’s beef ribs with black pepper and black vinegar; Karen Man making scallion pancakes; Katianna Hong slicing a log of babka of winter greens; Sam Chang serving Yu’s mung bean crêpe with Gulf shrimp; Kostow’s winter greens babka topped with melting goat butter; Justin Yu and a Flintstone-sized smoked beef rib; Christopher Kostow dusting his tartines of herbs and seaweed, served with whelk conserva; the wine pairings; Christopher Kostow, Justin Yu, Karen Man, Sam Chang, and the staff of The Restaurant at Meadowood. ~ by ulterior epicure on December 27, 2015.